Mediacom Park, N.Y., Nov. 12, 2015 – When Mediacom Communications Corporation moved into its new headquarters, the executive team of the nation’s 8th largest cable television operator had high expectations for the custom-designed building’s operational and cultural impact. Two years later, it is clear that the building has delivered well beyond those expectations. 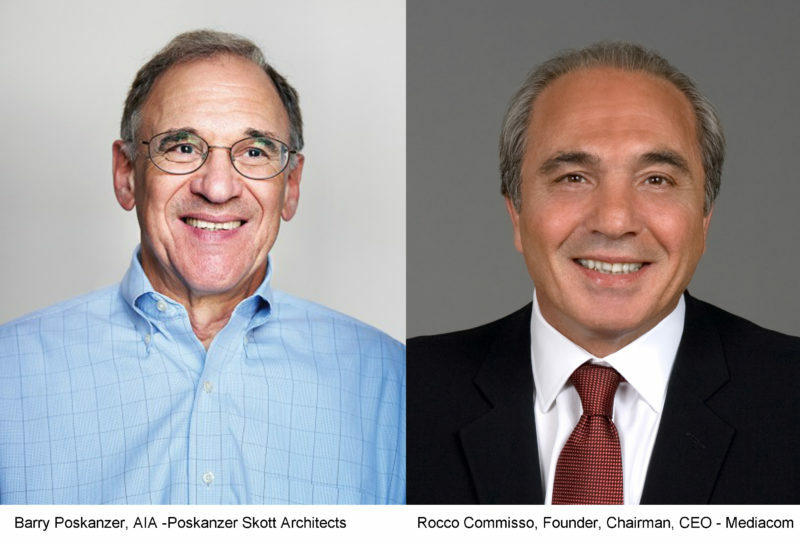 In the following interview, Rocco B. Commisso, Mediacom’s founder, chairman and CEO, and Barry Poskanzer, AIA, of Poskanzer Skott Architects, the project’s architect and planner, discuss the design strategy and success of Mediacom Park in the areas of recruiting, productivity, employee morale, community outreach and more. Accommodating growth was a main objective for the new headquarters. Beyond providing additional space, what benefits have you seen in your recruiting efforts? Commisso: Before moving to Mediacom Park, we had 250 employees and consultants working out of two separate office locations. In the two years since we’ve relocated to Mediacom Park, our corporate staff has grown to nearly 400 professionals, and they are all working under one roof. Even though we are the largest telecommunications company with its headquarters located between the Tappan Zee Bridge and Buffalo, we largely flew under the radar within our own community. With our new corporate office’s visibility and striking image, we are now garnering a great deal of interest from job seekers. In fact, our HR department has received more unsolicited resumes in the past year than ever before, including inquiries from area residents who have noticed – and been intrigued by – our building. Job candidates have reacted positively to the overall aesthetics of the environment we’ve created, especially the open office layout and generous workspaces. On-site amenities like the company-subsidized cafeteria and full-service fitness facility are also a big draw. Poskanzer: There is no quid pro quo that designing a corporate headquarters will automatically act as recruiting tool. What we do is physical environments that help a company reinforce its identity and establish a presence in the community with the hope that it will also act as a recruiting stimulus. The prominence of the hilltop location was always an important aspect of the headquarters design for Rocco. Capturing the crest of the hill offered us an opportunity to create some powerful and exciting visuals. It was a major reason this site was selected over two others. I’m pleased the building has made a strong impact on visitors, prospective employees and especially the Mediacom staff. Their response to the work environment is particularly satisfying because Rocco always emphasized this project was – first and foremost – about creating an exciting workplace for his employees. How has the building design changed the way Mediacom does business? Commisso: Bringing our engineering and IT departments into the same location as our accounting, finance, legal and operations teams has naturally enhanced efficiency. Throughout the design process, Barry and his team worked very closely with my wife Catherine, who heads up corporate administration and was the true inspiration behind our new facility. Early on, they decided upon creating multiple environments to accommodate a variety of work styles. The result is a mix of private offices, traditional cubicles, conferences spaces and breakout areas throughout the building. So departments like engineering and IT have access to more team oriented work spaces, while the finance and accounting groups have greater privacy. As a national company serving 1500 communities across 22 states, it’s important to bring our people together to build a collaborative corporate culture. In the past, our executives were forced to travel to remote offices and train small groups. The new headquarters accommodates large-group training, which reduces travel, enriches the overall experience for staff, and reinforces the company culture. This year, Mediacom Park was the host site for a leadership training conference attended by 200 senior members of our management team from across the country. In addition to this face-to-face capability, the building is equipped with advanced video conferencing technology to accommodate virtual connectivity. Poskanzer: One of our responsibilities is to promote productivity and avoid those things that impede employees from doing their work. The building’s minimal design elements help simplify a complex work environment. As an example, we considered the relationships between managers’ offices and those of their teams, as well as simplifying the employees’ journeys from car to desk, and from desk to copy room, kitchen and support spaces, etc. Even restrooms were specially designed to be convenient yet unobtrusive. Has the move had a positive impact on employee morale? Commisso: From an employee morale perspective, the move to Mediacom Park has been extremely positive. In addition to all of the considerations given to the location and design of the building, we incorporated indoor and outdoor areas where employees can discuss business and socialize. The 200-acre campus encourages our employees to engage in fresh-air activities, like walking and outdoor dining, which, along with the fitness center, supports our company-wide healthy-living initiatives. Poskanzer: Architects create environments in which, on a subconscious level, employees feel comfortable, valued and energized. It is obvious to every Mediacom employee that their company created a special place for them to work. Building this headquarters was not a committee process – it was the decision of one man to give his people the most interesting and supportive working environment. Has Mediacom’s presence – and the building’s unique design – been well received in the local community? Poskanzer: Rocco’s intention to be a good neighbor was clear from the beginning. The building, designed to function as a community asset, carefully considered the location of conference and meeting spaces, training rooms, and the cafeteria. Throughout the building, public spaces are situated so that daily visitors and special events do not disrupt Mediacom’s day-to-day operations. Commisso: Early on in the planning process, we committed to making our Mediacom Park facilities available for community functions. We are very proud that Mediacom Park has become a destination of choice for area organizations, as well as a beacon for economic development in Orange County and the Hudson Valley region. We recently hosted our second Leadership Orange event, a training program for a group of about 35 rising professionals from around the county. Hudson Valley Economic Development Corporation and several other organizations have also approached us about using the building for their gatherings. Since establishing the Mediacom Entrepreneur of Tomorrow Scholarship Program in 2014, we have invited over two dozen local scholarship recipients and their families to Mediacom Park to learn more about our company’s rich history and interact with our executive team. From a design perspective, what was the most gratifying part of this project? Poskanzer: Good buildings are the result of the interaction of three key players: The owner, the architect and the contractor. In this case, we were afforded a gracious owner and a superior construction manager in Bergen Engineering. Rocco gave us an incredible opportunity, and I thank him for that. It’s rare to have a client who has the desire to create an environment this interesting and noteworthy, and allocates the necessary funds to back up his dream. A building like this only occurs when the client allows it to happen.